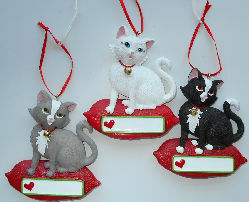 These cat ornaments are designed to be personalized with the cat's name. The resin ornament is 3 1/2" wide x 3 3/4" high. Loop attached for hanging. New. Only one of each style available.